If you would like your item personalised, please select the option below and enter your chosen name or initials. Your item will be sent to our embroiderers, so please allow an additional 4 working days for delivery. View examples of how the embroidery will look here. "All the cool, crisp sophistication of linen and soft warmth of baby alpaca. Easy understated elegance. 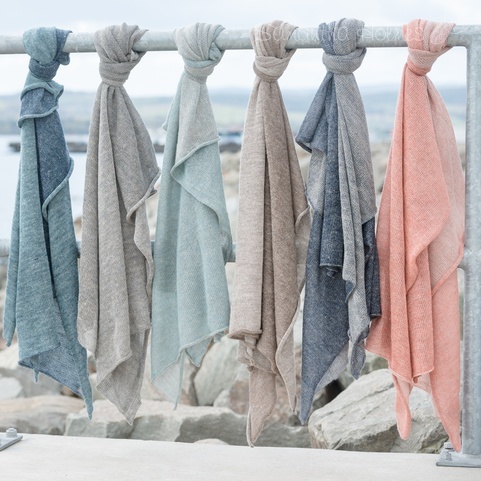 Perfect for Summer, holidays, travelling..."
You will love the unique drape of this shawl, its luxurious easy volume, combined with its casual marled texture and durability. Please note that this product no longer comes in the matching drawstring bag.